As the past quarter drew to a close, we welcomed 142 of you - including 27 asset owners - as new signatories to the PRI, and continued to engage existing signatories around the materiality of ESG in investing. In total, the PRI now has more than 2,350 signatories globally with US $82 trillion AUM. Collectively, you are a highly influential group in ESG investing. Against this backdrop, I’d like to share some highlights from the past quarter. We recently concluded our reporting cycle, and thank the ~1700 mandatory reporters (representing a 17% increase overall in 2019) for their participation. We had 569 investors report on the climate change indicators, compared to 480 in 2018. I have already outlined some headlines on signatory growth, which was particularly strong in areas including the US, the UK, Ireland and Benelux. Some of the new signatories we were very pleased to welcome in the past quarter include De Nederlandsche Bank - the Dutch central bank, AIA Group Limited, Poste Vita S.p.A., AG Insurance, Cuprum afp and Reinsurance Group of America, Incorporated. We released the report ESG, credit risk and ratings: part 3 – from disconnects to action areas. It explores the steps that both agencies and fixed income investors can take to factor in sustainability considerations when allocating capital and managing risks. The report builds on prior reports: Part 1: the state of play and Part 2: exploring the disconnects . We released the report Spotlight on RI in private debt, which considers responsible investment touchpoints throughout the deal cycle, from origination to exit, including investor case studies on best practices. Our signatory consultation on the Reporting Framework launched in early March. This is an important piece of work being supported by numerous roundtables around the world. The consultation closes on 30 April 2019, and we encourage signatories globally to participate. 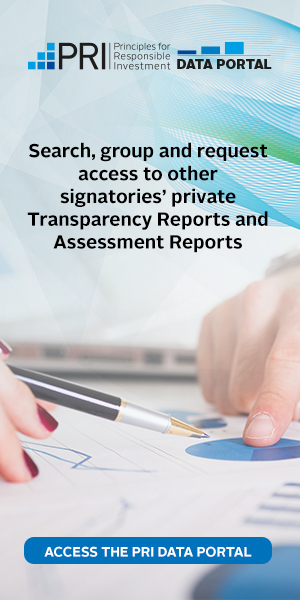 Consultation with you has showed strong support for the PRI to use the Reporting and Assessment process to further differentiate signatories at different stages of implementing the Principles. To encourage signatories to improve performance, share good practices and facilitate learning, we are very pleased to have launched the Leaders’ Group. This will highlight best practices on ESG integration on a specific themes, and in 2019 will focus on selection, appointment and monitoring of external managers by asset owner signatories. We have also launched the PRI Awards, which will recognise individually excellent projects conducted by signatories of all sizes, specialisms and levels of development. We’re really excited about the awards, which will be presented at PRI in Person. There’s still time to apply – the closing date for submissions is 30 April. We opened registration to PRI in Person, which will be held from 10 – 12 September 2019 in Paris. While some months away, registrations are already very strong. So if you haven’t registered, please do so soon! For newcomers to PRI in Person, you can get a flavor of what to expect from PRI in Person 2018 in San Francisco here. As mentioned in the PRI’s Work Programme, climate change continues to be the number one issue for our signatory base. Recognising this, it was gratifying to note that in December over 400 investors representing US$32 trillion AUM agreed to a Paris Agreement rulebook, which will enable implementation of the Paris Agreement and greater transparency, including agreement on how countries will measure and report on emissions. It has been interesting to note the ongoing news flow around climate also, including new influencers in the space such as Greta Thunberg who started a climate change youth strike. We noted with interest Norway’s trillion-dollar sovereign wealth fund will sell its stakes in oil and gas explorers and producers, and with some concern the ruling by the SEC that Exxon Mobil Corp is not required to let its shareholders vote on setting greenhouse gas targets. Looking ahead, we continue to address the key challenges laid out in our 10-year Blueprint for responsible investment, momentum is building on key areas including climate action, signatory accountability and the leading role of asset owners. This year’s climate work will include further developing our examination of the market-destabilising inevitable policy response that will come from governments if investors fail to act firmly on climate now, and continuing to work with the European Union on its potentially ground-breaking taxonomy project that will empower investors to guide capital flows toward sustainable development. Human rights and modern slavery will be another focus of our issue-specific work, that will continue to span the ESG spectrum. Our work for asset owners will move on from our manager selection guide to explore the processes of appointment and monitoring. At COP24, we saw hundreds of investors agreeing to a Paris Agreement rulebook. Quarterly update: is a potentially disruptive policy response to climate change inevitable? In the last few months, we have a seen a number of encouraging initiatives worldwide to focus more attention on the urgency around taking climate action.